BGO is an online casino site that is growing in popularity thanks to its decision to move towards providing excellent software and a great gaming experience as well as the actual products that it has on offer. 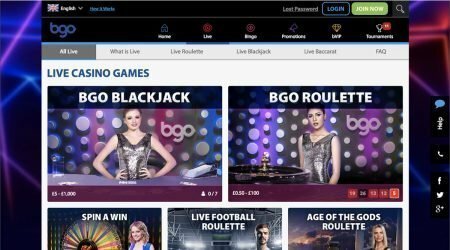 This has led to a surge in the number of players signing up to BGO, as well as advertising campaigns with well-known celebrities in order to raise its profile. Since setting up back in 2012, the casino has teamed up with software giants Playtech to enhance the user experience and draw in repeat custom as well as a whole host of new customers. 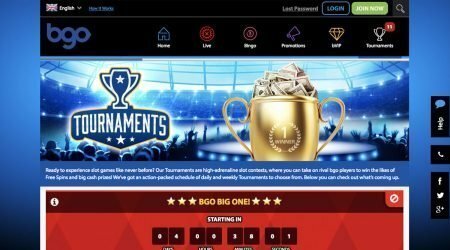 With so many different online casinos competing in the same space, it would appear that BGO has managed to find itself more of a unique selling point in order to gain an increase in market share. The casino typically operates in the UK and European markets and is licensed via the Channel Islands through the Alderney Gaming Commission. This means that it is fully regulated and therefore always pays out on time, and it has to store players’ deposited funds safely. Like many other good online casinos, BGO also offers you bonuses to keep you playing once you have signed up, as well as the more standard introductory bonuses that most places offer to the public in order to get consumers interested. Many of these bonuses revolve around promoting new products, or getting more public awareness for something. Much of its bonus promotion centres on Paris Hilton, who is the celebrity ambassador used in lots of the advertising. Currently, bonuses that you can get include a leaderboard-type tournament for one of its slot games, which will give you a free trip to Hollywood with all the trimmings if you win. Another is that it offers 50,000 free spins each day to promote one of its games, Eye of Horus, during a certain time period. It would appear that new promotions arrive each month, depending on the schedule. There are also cash prize draws, giveaways, and the chance to test out brand-new games if you are one of the people selected to give them a go. With so many intriguing promotions that many other online casinos do not offer, it is not surprising that BGO has grown in popularity. BGO also has an all-year-round tournament, allowing all its players to compete for various prizes, so there is always some form of bonus available for new and existing customers. Given that many casinos also only give bonuses targeted at new customers, this one seems refreshingly different. For those who are considering signing up, BGO offers attractive welcome bonuses to help with its persuasion tactics. These include giving you ten free spins regardless of whether you deposit or not, and also giving you the chance to pick up an additional 100 free spins when you make a deposit for the first time. It also happens to be easy to get started and set up your account, given its technological prowess, as you can verify your authenticity simply through your mobile phone. Interestingly, there are seemingly as many welcome bonuses as there are for those who have been customers for some time, which offers a good balance of rewarding custom and attracting new players – something that is not always on offer in online casinos. With a small minimum deposit, you can access most games pretty easily. Of course, some games that you want to wager on will incur a higher expected wager than others. Some card games, for example, will have tables with smaller wagers and ones with higher values required to get involved. This is not unusual and is typically seen in games such as poker and blackjack. This allows you a bit more of a choice about how much you want to wager, and gives you more control over how much you have to bet each time. Table games such as roulette will also vary in wagering requirements, with some tables demanding more. On each game, even bets such as red or black usually ask you to put more down than you would have to when picking a number from zero to 36. Slot games tend to be pretty even across the board, allowing you to choose however small a wager you want, across how many lines you desire. 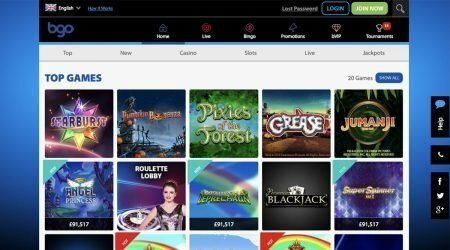 This is already discussed in part earlier on in this article, but it is clear that BGO likes to use the offer of free spins to attract in increased custom. From offering those who sign up free spins without even having to deposit anything, to ten times that amount if they make a deposit of £10 or more, it is clear that this is a strategy that the casino likes to employ. Free spins are also offered by way of promotion to existing customers, usually when it is trying to promote a specific game or get people playing at a certain hour or day of the week. With plenty of tournaments and leader board challenges that enable the chance of winning prizes, there are many promotions that run throughout the year, as well as some specific targeted ones. Many of these involve the opportunity to win prizes such as cash or package holidays as well as the standard win that you would get. This is where BGO really comes into its own and manages to fend off the increasing competition in the market. Given that there are a huge number of online casinos to choose from, BGO has found a way to set itself apart from the others by aiming to deliver the best online experience possible for all of its customers. Through partnerships and investment from software giants such as Playtech, it has been able to develop the kind of platform of which not many can boast. When this is tied into all the games that BGO has available, it can become a very convincing argument if games are the reason that you want to sign up to an online casino above everything else. Games include titles based on popular culture, such as Jumanji and Top Cat, as well as ever-popular options such as Pixies of the Forest and Rainbow Riches. As well as this, mobile users can access over 200 mobile games from the app, so you can play on the go. BGO also offers bingo as well as table, card, jackpot and slots games, so there is so much to try out and enjoy with this online casino. In case you want a little more interaction, there is also a live section that allows you to play and bet exactly as it happens on screen with live dealers available whenever you want to play. As you would expect with any major online casino – especially one with a big technological base behind it – all major forms of payment are accepted. These include Maestro alongside Mastercard and Visa, while other options such as Neteller and PaymentSafe are also accepted. This wide range of payment options means that there are many people who can access these facilities. One thing to note is that this is a Europe-centred market that does not cater outside of the UK and Europe, except for Canada. This means that it has the ability to change your currency and convert it from one into the other, but the exchange rate may not be the best available. If you have Norwegian or Swedish currencies, then you will be fine, as will countries with the euro. However, be sure to check if it’s worth converting your currency another way so that the rate is better. When it comes to customer service, general reviews of BGO seem to hold it in positive regard, though some do criticise the amount of time that it is made available. Currently, you can only get hold of the casino’s customer support team via either live chat or email, with no phone lines available to call. However, this does typically reduce costs and improve service elsewhere, which is why many online casinos now focus on the live chat instead. The opening hours are from 08:30 to midnight GMT each day, which will be an hour different in Europe. While it could be said that there are some gaps for some players, such as a lack of overnight customer support, and restrictions on location for many countries outside of Europe, there is a reason that BGO is able to grow in popularity and shows no signs of slowing down. With a serious input into making the gaming experience as enjoyable as possible, and providing as many different promotions as it can, it is clear that BGO knows its market and wants to continue to make inroads. If this is what you are after when it comes to online casinos, then BGO could well be the perfect one for you.